Description: Oswyn is of average height and quite lean and lanky of build. His brown hair is worn shaggy and tends to be tousled. High cheekbones, dark eyes, and thick brows contribute to a pensive demeanour. On the rare occasion he smiles, it's broad and displays his teeth. It would make him look rather boyish, were he to remember to shave more often. Otherwise, Oswyn presents as rather studious. His clothes are generally tidy and well-cared for. His complexion hints toward a lot of time spent indoors. There's something skittish about him, a haunted look he takes on from time to time. When he looks off into the distance, he always squints. Personality: Quiet and unassuming, Oswyn is good at blending into the background, and that's just how he likes it. Shy, he has always been more comfortable around books than people. While he doesn't say much, he is always thinking. A clever man, Oswyn has a dry sense of humour and a gift for sarcasm. He's simply either too polite or too shy to use it. Background: Oswyn's parents are bowyers and fletchers by trade and run a small, struggling shop in Arx. Oswyn's older sister, Muriel, learned the trade from her father. Oswyn did, too, but Muriel always had more interest in the shop, and so long as one of them kept the family business going, their parents were happy. While Muriel took naturally to archery, Oswyn was laughably bad at it. He simply couldn't see clearly at distance, a trouble that plagues him to this day. Up close was fine, which was good, because Oswyn's prime love was reading. Any free time he had after chores was spent up at the Great Archive, poking about, following the lives of various people. Always an outsider looking in, Oswyn lives vicariously through the journals. His greatest wish was to help tend to the collection, and so he became a scholar. Oswyn is dedicated to discovering and preserving knowledge. If it's out there, he'd like to know it. If it's lost, he'd like to find it. He loves nothing so much as following a promising paper trail, and is an avid researcher. Oswyn would dearly love to write a book of his own someday; he simply lacks a proper subject, though he always has a few ideas simmering. Sabella - Cheerful and kind princess. Signe - Wise and thoughtful shaman. Mia - Voracious reader and generous patron. Aurora - Talented costumer and tailor. Aella Oh a precious sweet little scholar. If it weren't for those meddling do-gooders perhaps I could have gotten him to turn purple. Or maybe even a color past purple?!? Now we'll never know and we'll have to all be satisfied for boring red. Great. Good job everyone. Aethan A healer who can also ride a horse. Very useful. Agatha He's awfully bashful about taking some notes! But at least he's willing to share them. Ajax An excellent snowball maker. I should interact with the man some more. Alarissa He is a scholar and foremost someone to be admired. His shop is filled with books priced and meant to be enjoyed by those who cannot afford to spend a lifes savings. He has the manners befitting a noble and I find... I find that he is precisely who I like to deal with. Aleksei He's got a really cool rock! Polite guy. Alessandro An estimable scholar, who most obligingly made me a copy of Principia's Anatomy for Margret. Anyone who can give me a gift to make my wife happy is excellent in my book. Ariella Oswyn is a very nice boy and an excellent physician. Arthen He seems a good enough man. Smart, but that ain't no surprise for a Scholar, now is it? I kind of laugh inside when he squints like he does. Not bein' mean. Just tickles me a little, that's all. I like the man's interest in maps. We talked a good deal about 'em. We both know the value of a good map. Auda A Scholar, adorably awkward and dedicated to his path. A pleasure to meet. Aurora He seems shy, but agreed to take part in a social experiment. No disabled. Barric A scholar who was willing to attempt the gauntlet, with training, he might not nearly die from it, but he is determined and I can respect that. Bianca Without thought, I threw this sweet and shy man into the midst of a Baroness and a Highlord to socially fend for himself. He handled himself well, both polite and fervent in his desire to assist -- and as always ever diligent to the works of the Scholars of Vellichor. I look forward to working with him more directly in the future. Bianca An extraordinary man with a gentle heart. And a wonderful Scholar at that. Brigida Everything you'd expect from a scholar and nothing you'd expect from an explorer. Nervous, quiet and bookish. Nice enough beard, though. Calandra Thank the gods we had a medic in our midst! I owe Scholar Oswyn a favor for tending to our party guests. Carmen The man is as jumpy as a cat in a thunderstorm. Good for him, making something of himself though. Too many Lowers kids never make it further than the Upper Borroughs. He's seen the edge of the world. Coraline Very competent and good in a tight spot. Cullen A scholar of Vellichor and a shopkeeper of books and writing supplies. Seems quite wise in the ways of finding important leads in a pile of worthlessness and distractions. A good man to know, I'd think. Gods know I need the help. Cyril Owns a bookstore in Arx. He doesn't carry much in stewardship but is a scholar who teaches other stuff. Delilah The diamond-plane facets of this man's mind may not be illuminated for all to see, but a short time in his company revealed a keen grasp of many subjects. Introverted, assuredly, but with the powerful gift of intelligence on his side. I doubt much gets past him. Echo The shy and scholarly type, who seems to have the mysterious ability of getting himself into all sorts of fun and (probably) embarassing things! Evonleigh So very quiet but clearly a bright mind behind those shy eyes. Faruq Apparently a gentle boy, who is very supportive of his staff. Sounds like a good person to me. Faye A scholar and an apparently well-informed man. I'm certain we have some interests in common. I hope we'll get the chance to speak again. Fiora Don't worry, kiddo. I don't target the innocent. Usually. Galen The Scholar seems to have a proper respect for information and gives and receives it without condition. Gareth A scholar that Sabella has seemed to take a liking to. Mild mannered and fitting to his position. I'm sure he'll go far. As far as scholars go, that is. Helena The almost--but-not-quite-"conditionally" Senior Scholar is quite polite, proper and pleasant. He almost smiled a couple of times and definitely blushed, poor handsome boy. I'm glad to know he made it out of the Everwinter with all of his toes. Isidora Always good to meet another healer. Especially on a tough case. Jacali He's a studious one, him. Seems he's got a head on his shoulders... might well have to pick at it later, I might. Jarel Definitely has better manners then I do. I thank him for giving me the advice he did so I wouldn't come out as barbaric as I definitely tend to be. Jasher Dedicated to his task, unwilling to let silence stand. A pleasant shopkeeper. Jeffeth A scholar! He seems like a good sort, couldn't help me out but he seemed sad about that. And promised he would try to help next week. What a guy! Jordan A scholarly man. Might be visually impaired, since he said he couldn't see the people fighting at the pit. I'll ask him some questions later. Scholars are good to know about. Josephine A scholar, a man of talent, and of spotting canoodlers in the stack it would seem. So observant. Poor boy. Juliana Master Spencer, damn good Phyician and most probably a much more acceptable bedside manner, I am sure he will go far. Kenna He was more than charming in that shop of his, and //very// helpful with what I needed. I'll be back without a doubt! Lou I went in search of Oswyn in hopes he'd be able to help me with a task. Not only was he willing and able, but he had some insightful things to say. Can't wait to work with him. Luca Sometimes you can just tell when a person is in over their head in the Lyceum Ward. But Oswyn took my liquor when I offered it, and he hasn't fled yet. Perhaps there is hope for him yet. I'm sure I'll see more of him in the future if he's to be an acquaintance of Master Caspian's. Lucita A young scholar, dutiful, a little awkward and shy but helpful. He seemed nice. Lumen A young scholar. Handsome and humble, though possibly somewhat socially inept. Lys A concerned healer (or is it physician??) who came to help Lady Ariella after I stabbed her in the shoulder. He seems nice, and good at his craft. Melody A cute and rather shy scholar -- I really don't know how to break a shell like that but I really can't help but want to. Meriah Capable. Glad you were around. Cool head under pressure. Miranda Oswyn's retainer, Milton, made a fabulous groom! He was very enthusiastic when it came to the kiss! Mirari I threw a pastry at him. He didn't yell, didn't seem bothered. That is the kind of man I need in my life, someone who enjoys having things lobbed in his direction without complaint. Mirk A scholar and a gentleman. Quite helpful, and speaks to me in my own language, to boot. Niklas My scholarly friend and former protege. A good man to have at your back, though probably when at your back is a library or an archive. Norwood Shy, or just not a crowds person? On Princess Sabella's side I'm afraid he will have no time to indulge in either. Nuala He reminds me a fair bit of an owl: watching, not always comfortable in plain sight, and probably a lot more adventurous or crafty than he lets on. Oriana A Scholar very knowledgeable about artifice and artificers. We had a most interesting conversation about brass. And other things. Ouida If the mark of a true scholar is first and foremost grit and willingness to stick out an experience to the end, no matter what surprising turns it might take, why then, I greatly look forward to claiming a tome written from Scholar Oswyn one day! A very charming man. Petal He is studious, caring and studies the ways of people many in Arvan would rather ignore and forget about. Quenia A Scholar with a good head on his shoulders. He helped with the mapping of Granato, as well as keeping everyone well patched up, when we went to explore there. I'm glad to see him back from his travels. Reigna A sweet young man, and so very nervous. I tried to put him at ease, and it seemed to be better near the end. Still, I think he will be a valuable addition to our ranks. Rinel Competent, practical, annd level-headed. Excellent qualities to have in both a scholar and physician. River Very mild and pleasant, A shame he is so busy, I'm sure scribes would be very useful in projects. Rook Master Oswyn seems to squint a lot, which makes me immediately insist he's a scholar I've seen before in the halls, but we've only just truly met. I'm sure there's a great deal we could talk about. Rosalie A delightful man! I feel truly bad for casting him a villain before properly getting to know him. But that has been erased! I will have to make a friend of him instead! Rukhnis A scholar with a somewhat peculiar manner, given to squinting and perhaps also to the study of dark knowledge. Sabella My favorite scholar and the on to whom I entrust all my journals. He's quite clever, if a little shy. Don't worry, I'll fix that! Sorrel Scholar Oswyn is very studious and really an excellent resource when you can't find a book or source material on your own. Sometimes he needs a little coaxing to help with research, but that's just because he seems more comfortable with books than people. Sparte A sharp scholar, likable in the way you like a cat who never shows you affection. Just sort of stares at you with that air of toleration and dignified exasperation that, yes, having you there is preferable to not having you there. Sort of like how b- Hm, what? Oh, right. Scholar Oswyn! Nice guy. Tabitha A Scholar who owns the most wonderful little shop that's stocked with scribing supplies and books. You'd expect a man in his line of work to be clever and perhaps even a little shy, and indeed he is. But he's kind too, with an empathy for my own shyness. I think he's a lovely person. Talen A scholarly sort, as you'd expect from a Scholar. Though quiet, he does cut straight to the chase, which is good. Learning how to riddle, riddle, riddle with Master Spencer! Theo A very pretty boy. Thesarin Countess speaks well of him. He and her talked of books, but I hear he's a Scholar who'll step out from the library. 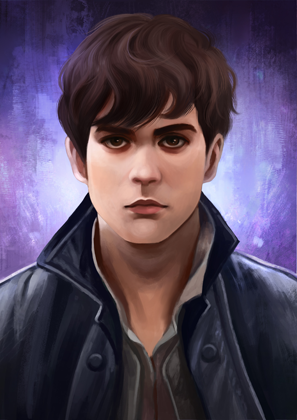 Tynan Scholar Oswyn is a skittish man with tempered words and a nervous demeanor at times. Still, there is a keen intellect in there and a curious outlook on the world which I admire. Venturo A scholar by trade, it seems, though I do wonder why he touched that ring on his right finger. Something to share stories with, perhaps. Victus Bookie, explorer, mapper... Man does a lot, eh? Vitalis Precisely what you'd want a devotee of Vellichor to be: thoughtful, keen-witted, and reassuring. That cinnamon tea was good too, though a splash of spirits wouldn't have gone amiss.